At CJS Roofing & Building we pride ourselves on completing all our roofing contracts on time and within budget! 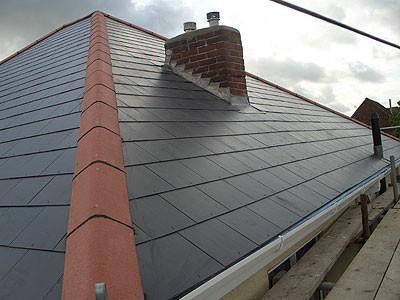 CJS Roofing & Building are one of Surrey’s leading suppliers and fitters of new roofs as well as being re-roofing specialists. No matter what your roofing needs we’re here to help and offer year-round roofing services to our clients across Croydon, Epsom and the whole of Surrey. From general roof repairs and renovations through to fitting new roofs the team at CJS Roofing & Building are here for you. If your roof is beyond repair or you’re looking for something new then CJS Roofing & Building can provide a full new roofing service for our clients who want a new roof for the home or commercial property. Our team of expert roofers can provide you with a site inspection and as well as a free quote we can even build you a whole new roof. From recommending materials and creating a design through to installing your new roof system CJS Roofing & Building we can help at every stage of the construction process. No matter what style of roof you’re looking for we have the solution for you. For more information please contact us on 07934 346002 or fill out the contact form here.